The state of Florida is unique in that it requires special course attendance for individuals whose driver licenses have been suspended by the State for reaching a certain number of points on their driving record, or for being declared a habitual traffic offender. In either situation, the state mandates the completion of a 12 hour Florida advanced driver improvement course (a.k.a. "ADI school"). 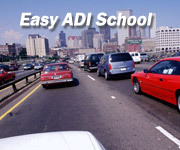 ADI courses are available online or in the classroom. Due to the seriousness of the circumstances that cause a driver to be required to complete an advanced driver improvement course in Florida, the requirements and class curriculum are a bit different from what one might expect from a basic driver improvement course. A large portion of the course consists of questions and answers that are designed to stimulate thought and conversation between the student and teacher about the attitudes or issues that may have caused the driver to behave in a manner that resulted in the loss of their driving privileges. As with all online courses, the Florida advanced driver improvement online course allows the user to log in and out of the course as often as necessary and the course is available 24 /7, so that they can work the course into their schedule. This is especially important since the total course length is 12 hours. As the saying goes, “Driving is not a right, it is a privilege,” and it takes personal responsibility to be safe and make the right decisions while on the roadways. Failing to do so can cause a driver to lose his or her driving privilege when the state takes away that person’s driver’s license. Kudos to Florida for requiring drivers to complete a training course that will cause them to rethink their habits while behind the wheel, and will hopefully improve their attitude and skill level. It is through this education that they can become less likely to be cited by law enforcement across the Sunshine State in the future. Online courses are not for everyone. If preferred, classroom courses are available across Florida, offering the same state approved Florida advanced driver improvement courses that are offered online. Each school is different in how it breaks up the 12-hour program, and the question and answer session offered as part of the class can be done in a more conversational arrangement, which is not possible in the online format. The decision for most drivers (online or classroom), depends on how comfortable they are on a computer and the flexibility their schedule allows. Hopefully you will never need to take a Florida ADI course, but if you do, you will now be a bit more informed as to what your options are. Drive Safe Florida! Driver Training Associates, Inc. (DTA) is a defensive driving and traffic school course leader with offices in Florida, Texas, and New York. DTA was started in 1977 as a classroom provider and now offers all of its courses in online formats as well. We were the first company to develop a State-approved 12-hour Advanced Driver Improvement course for Florida drivers. DTA is approved to offer Texas defensive driving, New York Defensive Driving, and Florida traffic school courses.